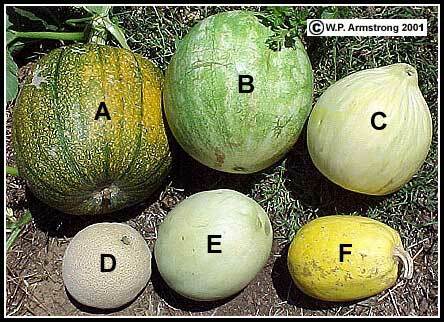 Assorted melons & squash: A. Pumpkin, B. Watermelon, C. Crenshaw Melon, D. Cantaloupe, E. Honeydew Melon, F. Spaghetti Squash. The squash and pumpkin are varieties of Cucurbita pepo, while the melons & canteloupe are varieties of Cucumis melo. The watermelon is a variety of Citrullus lanatus (var. lanatus). Ripe pickle cucumbers (Cucumis sativus). Pickles are made from cucumber varieties such as the "gherkin" which have smaller fruits, a thin flesh and numerous seeds. The fruits are soaked in a brine soltion. Depending on the type of pickles, a boiling water-vinegar solution (containing other spices) is poured over the pickles. [Lactic acid fermentation by bacteria (Lactobacillus plantarum) is also responsible for the acidity and flavor of some pickles as well as sauerkraut.] In dill pickles, the spice dill (Anethum graveolens, Apiaceae) is also added to give them a special flavor. Sugar is added to the boiling water-vinegar solution in sweet pickles. Teasel cucumber or teasel gourd (Cucumis dipsaceus), another curious species of Cucumis with yellowish fruits covered with a dense layer of soft spines. 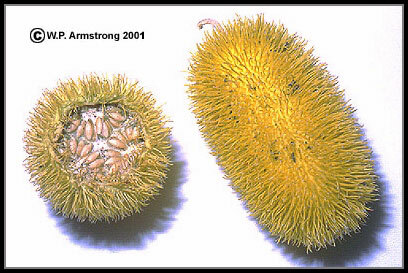 The common name is derived from its superficial resemblance to the spiny fruit bur of the teasel plant (Dipsacus sativus), a member of the teasel family (Dipsacaceae) shown in next photo. The teasel gourd is native to northeastern tropical Africa and is cultivated throught the world as an ornamental. It is naturalized in the Hawaiian islands and in the Cape region of Baja California. 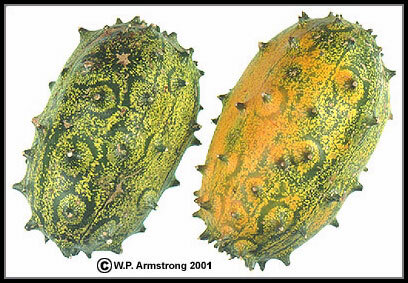 The spiny African horned cucumber or hedgehog gourd (C. metuliferus) is another species of Cucumis grown as an ornamental and as food. 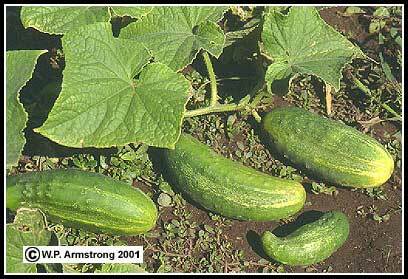 The numerous varieties of delicious melons also belong to the genus Cucumis. Most melons are considered to be varieties of Cucumis melo. Teasel burs (Dipsacus sativus). In real life they do not hatch from eggs. This plant does not belong to the gourd family (Cucurbitaceae) and is not related to the teasel cucumber. The spiny African horned cucumber or hedgehog gourd (Cucumis metuliferus) is also grown as a decorative ornamental gourd and as food. The exocarp is covered with distinctive spiny protuberances. It is often sold in supermarkets in the United States. It supposedly has a banana-lime flavor and is used in fruit salads, sundaes and drinks.